Slanted photo booth frames at low wholesale prices. We have been making this specialty frame since 1980 and one of the first to bring it to the market. Ever since it’s been one of our most enjoyable styles to make. Our quality is one of a kind on the market. Beware of imported frames, they have been cheapened to the point they have become useless as a photo frame holder and protector. Starting at only $0.55 a frame. 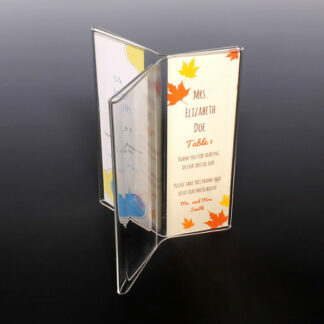 The sizes we offer are designed to fit picture strips that photo booths print out and are slanted back for easy viewing. 5 stock sizes available. Custom sizes are also available, so please contact us (minimums apply). Features an extra thick, prime grade, distortion free acrylic that’s robust and made to last. We look forward to being of service to you and your event.